WASHINGTON — Boeing is the biggest aircraft manufacturer in the world, but the losses of the joint strike fighter program and Air Force’s long range strike bomber still weigh heavily on the company’s defense unit, and had prompted some in industry to wonder if the company’s days of making cutting edge combat aircraft were numbered. Conventional wisdom held that Boeing needed to win either the Navy’s unmanned tanker drone or the Air Force’s next-generation trainer aircraft contract to keep its St. Louis, Mo.-based facility building tactical aircraft into the 2030s. a contract for the Air Force’s Huey replacement helicopter was seen as out of reach as the service had formerly expressed a preference for sole-sourcing Black Hawks. But in a matter of weeks, Boeing racked up all three contracts, shocking the defense establishment. First came the MQ-25 Stingray award for the Navy’s unmanned tanker drone on Aug. 30. An initial $805 million contract covers the design, development, fabrication, test and delivery of four Stingray drones, but Navy acquisition boss James Geurts said the entire program could be worth up to $13 billion for 72 aircraft. “It is a big win on a high-visibility competition/program and gives Boeing a franchise unmanned program,” wrote Roman Schweizer of Cowen Washington Research Group on Sept. 4. Boeing defeated Lockheed Martin and General Atomics to win the program — and that victory allows Boeing to cement its own status as the Navy’s premier manufacturer of fixed-wing aircraft. Boeing is the first MQ-25 competitor to show off a prototype of its offering. Then on Monday, Boeing won another big competition — this time worth up to $2.38 billion — for the Air Force’s UH-1N replacement helicopter. Boeing and Leonardo were immediately obligated $375 million for the initial four MH-139 helicopters, which will be built at Leonardo’s commercial AW-139 production plant in Philadelphia. It was huge news for Leonardo, a large Italian defense contractor that had been attempting to break into the U.S. market with a major program for about a decade. But for Boeing, it was still a relatively small aircraft procurement program, with Byron Callan, an analyst with Capital Alpha Partners, writing that there were probably few opportunities for Boeing-Leonardo to sell the MH-139 to other users in the U.S. military. Air Force Secretary Heather Wilson doesn't believe the Huey replacement is "a complicated procurement." However, Boeing on Thursday won the major opportunity it had been seeking: the Air Force’s T-X program. Boeing’s clean sheet design beat out Lockheed and Leonardo to win a contract worth up to $9.2 billion. It’s likely the actual program will be worth considerably less — Boeing would be obligated a total of $9.2 billion over time if the Air Force decides to execute all options on the contract for 475 training jets, and the services’ program of record sits at 350 jets. But its importance to Boeing extends past the award’s total contract value. 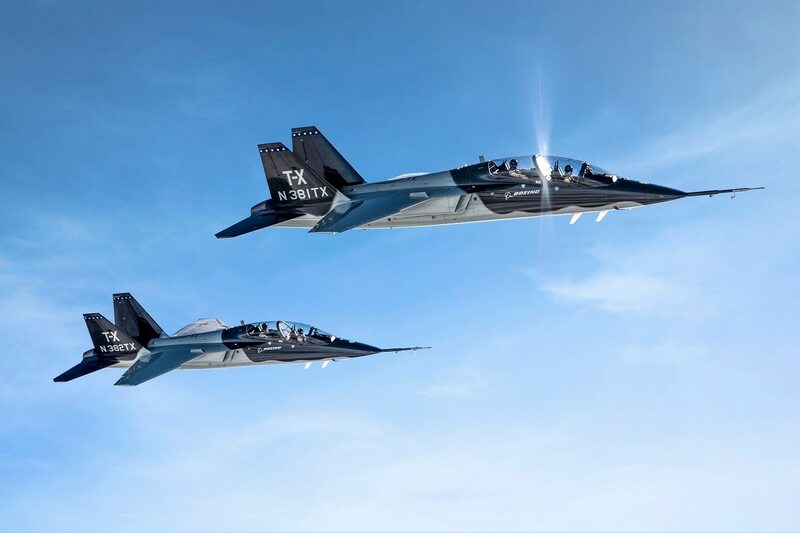 Winning T-X was “possibly critical” for Boeing’s St. Louis plant and for its defense business to remain a competitive player in tactical aircraft design, said Callan. Analysts like Callan and Schweizer had speculated that Boeing would bid very aggressively to try to win the contract, but the question was whether the company could possibly offer a new purpose-built design at a significantly lower price point than competitors Lockheed Martin and Leonardo, which both proposed aircraft designs already in production and use by foreign militaries. It appears Boeing may have been able to do just that. Richard Aboulafia told Defense News in 2017 that the Lockheed and Leonardo trainers came with a price tag of about $25 million, although both companies were expected to bid lower than that to be competitive. Meanwhile, Jim McAleese of McAleese & Associates pegged the unit cost of Boeing’s T-X at an “eye-watering” $19 million, far below the Air Force’s $45 million per plane expectation. The race has evolved into something not unlike an episode of a reality TV show, featuring industry teams breaking up, companies unexpectedly dropping out and upstart entries coming in at the last minute. That low price “establishes an extremely high burden for disappointed offerors of Lockheed or Leonardo” to launch a successful protest with the Government Accountability Office, he stated in a Sept. 28 email, although Lockheed and Leonardo could potentially argue that the Air Force’s cost and schedule risk assessments are too optimistic, given that Boeing offered a new airframe. Callan also pointed out that the MQ-25 and T-X wins could be advantageous to Boeing’s commercial business. In the past, the defense sector has developed new materials that have later been adapted for use by the airline industry. With Boeing acquiring autonomy-focused businesses like Liquid Robotics and Aurora while investing in startups through its HorizonX organization, it is possible advances in military unmanned tech could give way to autonomous commercial cargo planes or other future concepts.